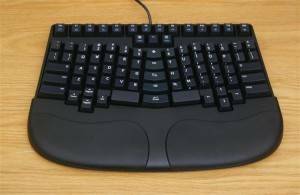 We’ve published long form reviews on ergonomic keyboards since 2011. We really know which ergonomic keyboards are the best in the world. So what’s the best ergonomic keyboard? We wish we could point you to one model that would work for everyone. That simply can’t be done. We are all so very different. A chair you find comfortable may be uncomfortable to someone your exact size. Our hands, wrists, writing styles, desks, offices, chairs, and so many other factors require us to try a few models that work for us AND for our budget. Some of these keyboards are less than $50. Some get close to a grand. However, we can recommend the best ergonomic keyboards for most people. You can use the following table as a super quick guide to get in and grab a recommendation without much time. You can’t go wrong with these recommendations. If you have time, below this table is our summary of all types of ergonomic keyboards and we recommend skimming the rest of the page to see if something catches your attention and should be on your consideration list to find your best ergonomic keyboard. You can't go wrong with this keyboard. The Kinesis Freestyle2 with the VIP3 kit allows for an unusual degree of flexibility in finding the absolute best position for you. If later you find you need a 90° angle, you can buy the Ascent Accessory. The Goldtouch is not as flexible as the Kinesis but also not as expensive. Some say this keyboard has slightly better key action than the Freestyle. In a nutshell, this is like a thicker version of the Freestyle with mechanical keys and a built-in VIP kit. It may be too thick for some and too costly though we believe this keyboard is an excellent value. 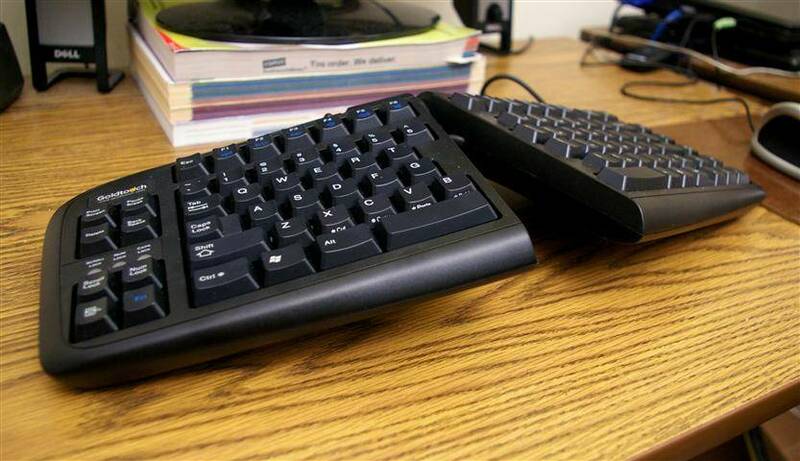 If mechanical keys are a no compromise option for you, then this is your best ergonomic keyboard. If you are serious about the best ergonomic keyboard regardless of the time it would take to relearn how to type, we recommend the Kinesis Advantage. This design is time-tested and really hard to beat. It takes a few hours to a few days to get used to an optimal ergonomic keyboard. While this keyboard could use a bit more ergonomics, it won't take you more than an hour to get back to your normal typing speed. A good balance for folks ready to be more ergonomic but not yet ready to invest in top of line devices. Also, one of the few options under $50. Want to dig in a little deeper? This comprehensive guide will show the various kinds of ergonomic keyboards and point you to more information about each. For completeness, I have included products I have not tried as well as those I have already reviewed. If you are considering the purchase of an ergonomic keyboard and don’t already some idea which one you want, this guide is meant to serve as your starting point. It is continually updated as I encounter new products and information. If you don’t want to read through all the boring stuff, feel free to jump to whatever section interests you using the index below. 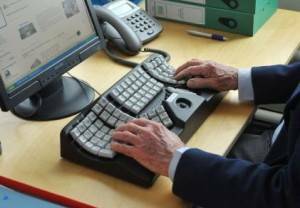 Introduction: What makes a keyboard ergonomic? The Adjustables – Keyboards you can change to suit yourself. Familiar Curves – You’ll probably recognize these iconic designs from wherever keyboards are sold. The Convex, Concave, and Expensive – The casual and cash-strapped may prefer to skip this part. The Just-Plain-Weird – If you’re looking for something wild and unusual. 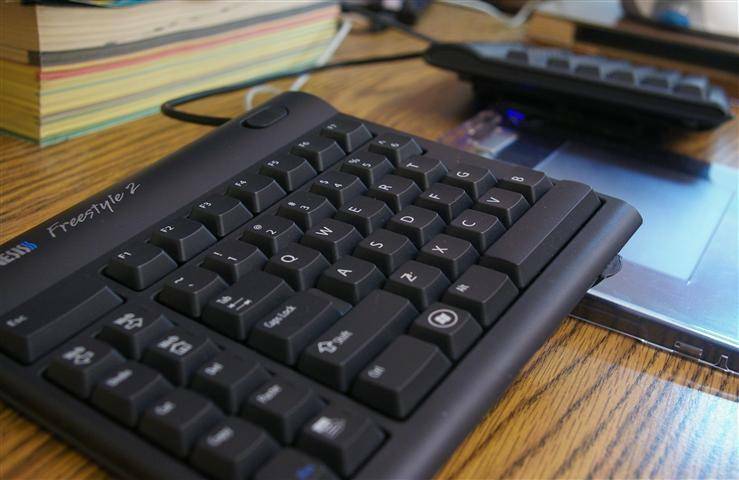 What makes a keyboard the best ergonomic keyboard? To grossly oversimplify (something I’ll be doing a lot in order to keep this guide shorter than the U.S. Tax Code) the basic aim of ergonomic keyboards is to keep your hands in a “natural” posture while typing. What do we mean by natural? As you might have guessed, the answer varies depending on which manufacturer’s engineers you ask. While there is some dispute over what position is most “natural,” there is general agreement on certain wrist positions that can be harmful. Deviation – This means lateral bending of the wrists, like washing a window or waving goodbye without moving your arm. If you watch yourself while typing on a standard keyboard, you may notice that your elbows are angled in while your wrists are angled out to line up with the keys. This is the number one dangerous posture that ergonomic keyboards try to correct, usually by curving, splitting, or separating the key rows. These angled strategies are referred to collectively as splay. Pronation – Put your hand palm down on a flat surface. Congratulations – you have just experienced pronation, or inward twisting of the wrist. This problem is corrected by raising up the middle of the keyboard, a configuration called tenting because it more or less describes that shape. Some designs take this to an extreme, splitting the keyboard and arranging the two halves vertically like an accordion. At the other end of the spectrum, other designs discount pronation entirely and make no effort to address it. Palm Rests – No, not wrist rests – palm rests. A wrist rest is that terrible thing people stick in front of their mice to provide extra compression for the carpal tunnel and hasten the onset of RSI. 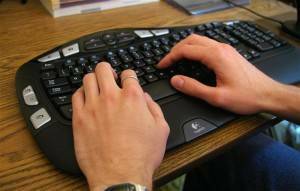 A palm rest is a usually-padded area at the front of a keyboard where your hands can pause for a break between paragraphs. Some keyboards have them built in, or as optional accessories. For those that don’t, you can always purchase a free-standing set. 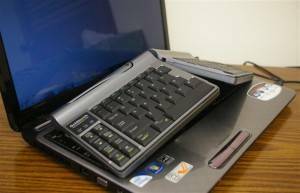 Small Footprint – While having a smaller keyboard doesn’t do much for the typing side of the equation, it does leave more room for the mouse so that you can reach it more easily. The trade-off is, you usually have to sacrifice the the right-hand numeric keypad for an overlay version built into the main part of the board. Key Action – You might or might not have noticed this, but the keys on standard keyboards often require a lot of effort to press. They must also be pressed all the way to end-of-travel to register a keystroke, causing hundreds of little sudden-stop shocks to your fingers as you type. Better ergonomic keyboards (as opposed to the consumer-grade ones available at Staples and Wal-Mart) often use special low-force key switches that make typing easier. The really high-end ones use mechanical key switches, which provide the ultimate typing experience and also last much longer than their membrane counterparts. Key Layout – The standard typewriter layout, which was old when our great-grandparents were young, has much room for innovation and improvement. 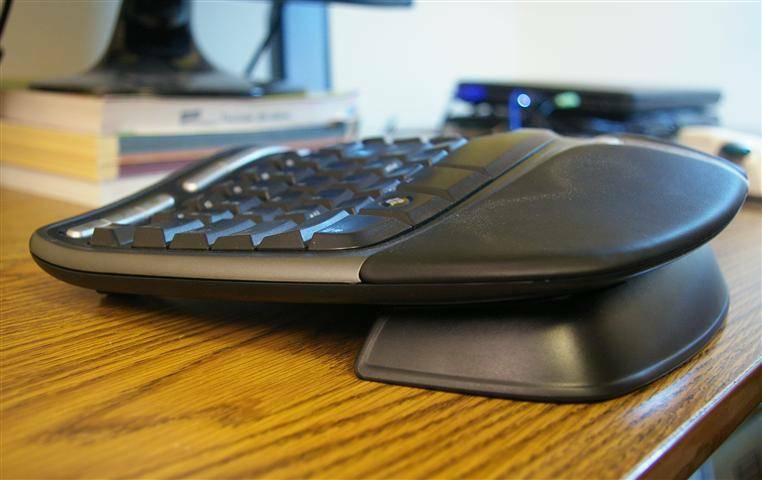 Some ergonomic keyboards straighten out the staggered rows, or put the keys into concave “wells,” or curve the rows laterally to match your fingers or move essential keys to new, more efficient locations. Often, these changes are so major that a bit of retraining is required in order to use the keyboard, and you may lose your ability to type proficiently on anything else. Next up: A quiz on everything we’ve covered so far. Kidding! Let’s move past the theoretical diatribe and get into some actual keyboards to sort out your best ergonomic keyboard…. If you don’t read any of the rest of this tome (and I’d be the last to blame you if not) please at least read this part. The two keyboards I’m going to cover here are among my personal two top choices because, in addition to their other virtues, both are completely adjustable. Ergonomics is all about what works for you as an individual, so I put a high premium on something that can be customized for each person’s preferences. The Goldtouch is basically a narrow keyboard that’s been chopped in half and put back together with a locking ball joint. The result is a design that can be bent and twisted into a practically infinite variety of positions. It even does negative tilt, though in my opinion that feature is implemented poorly. 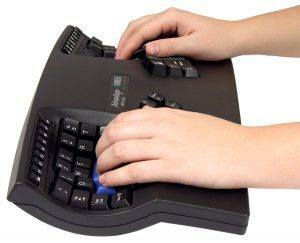 With such flexibility, the Goldtouch keyboard can potentially address just about any harmful or painful wrist position. The low-force keys are better than any other non-mechanical keyboard I’ve tried. The Goldtouch has no built-in or attachable palm rests, but Keyovation offers a nice inexpensive set of gel ones that go well with the keyboard. Price: List price of $129 but often on sale. Check the latest price. Keyovation also has the distinction of providing the only really portable ergonomic keyboard, a miniaturized version of their larger model called the Goldtouch Go. All the good things I said about the Goldtouch apply to the smaller version, with the exception of the key action: the Go has laptop-style keys. My own keyboard of choice is the ever-popular Kinesis Freestyle. Like the Goldtouch, the Freestyle comes in two halves. Unlike the Goldtouch, however, the two halves can be detached completely from one another and separated up to 8″ on the standard model or 20″ on the wider version. This allows for an unusual degree of flexibility in positioning but requires Kinesis accessory kits in order to take advantage of that flexibility. There’s a kit to do tenting, one that adds palm rests, and another (really expensive) that converts the Freestyle into a vertical keyboard similar to the Safetype. The Freestyle uses low-force keys, but their action is not quite as pleasant, to me, as that on the Goldtouch. For this reason, I generally recommend the Keyovation offering over the Freestyle – unless, like me, the user needs complete separation between the halves. Price: List for Freestyle2 around $99 but often on sale. Check the latest pricing. My original Freestyle review is here, and the Freestyle2 update review is here. Are familiar curves the best ergonomic keyboards? When I say “ergonomic keyboard,” chances are that you imagine something like the classic Microsoft design, most recently incarnated as the MS Natural 4000. This curved/split layout works pretty well for straightening the wrists. The palm rest is smooth and well-positioned, and there is a negative tilt attachment in the form of a large curvy bar that snaps on the front. There isn’t, however, any way to adjust anything else on the keyboard; it’s all fixed to average defaults. Also, the key action – particularly the Infamous Immovable Spacebar – is, in my view, deplorable. And, like all keyboards with a separate numeric keypad on the right, the 4000 is too big for its own good. Still, the Microsoft board remains popular with a vast user base, and it’s hard to beat the price tag. Price: Lists for roughly $60.0o. Often on sale. Check latest prices. Some users find the total split of the Microsoft 4000 scary and prefer a gentle intermediate step from the straight boards of the past to the weird shapes of the future. For these more cautious types, there are many choices available. The one I’ve reviewed is the Microsoft Sculpt Comfort Keyboard, which offers a gently rounded layout, a bit of tenting in the middle, and negative tilt feet on the front (which really just level the keyboard, as it has a good bit of positive tilt bias built in). The Sculpt is Microsoft’s newest ergonomic keyboard as of this writing, having been launched in conjunction with Windows 8. Price: Lists for about $120. Often on sale. Check latest prices. The Comfort Wave is one of my favorite lower-end ergonomic keyboards. It features good key action, a cushy palm rest, and a curiously comfortable “wave” shape to the key rows (hence the name). The K350 resembles an ordinary wireless keyboard enough that most people shouldn’t have any trouble adjusting to its more ergonomic curves. Hence, it would make a great gift for someone currently suffering with a non-ergonomic freebie keyboard. Price: Lists for about $60 with a mouse. Check the latest pricing here. That’s it for anything you’d likely recognize on the street! Next up are more exotic keyboards though for many one in this category is the best ergonomic keyboard. Nothing on this page costs much under $200, so the keyboards featured here are mostly the domain of programmers, medical transcriptionists, and people with severe physical issues related to typing. If you’re just getting started with ergonomics, this is probably not where you want to begin. If, however, you actually need an extreme design change and high-end hardware, you may want to consider one of these models for your new keyboard. The Kinesis Advantage ergonomic keyboard, which hit the market in its current form about when I hit kindergarten, is a time-tested classic of high-end ergonomics. Despite its $300+ price tag, one generally hears complaints about the cost only from people who haven’t bought it. Those who have tend to consider it a necessity of life, worth any sacrifice to preserve. The Advantage keys are arranged in two side-by-side “bowls,” placed such that your fingers hang comfortably over them while your palms rest on the front surface. This puts the hands in an amazingly relaxed position, and the high-end mechanical key switches make the overall typing experience a dream. The two bowls are separated enough to keep your arms straight, discouraging deviation, and there is an almost imperceptible tent shape to handle pronation. Watch out for the positive slope of the palm rests, though, as this can encourage wrist extension. Because of this, the Advantage really needs a high work surface – one much higher than you would use with any other keyboard except the Maltron (below). Price: Lists for about $349.00 but often found cheaper. Check the latest price here. If you thought the Kinesis Advantage was expensive, just take a look at the Maltron: $700 of pure European geekdom. All my attempts to get a sample Maltron have failed miserably, as there are only two US distributors, and neither one sends out samples. 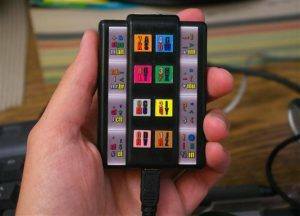 Maltron is really way beyond what most users – even advanced ones – would need or want to pay for. The company offers several models, including some that can be used with just one hand. The two-handed models are available in QWERTY, AZERTY, and DVORAK layouts, plus a special “Maltron” keyboard layout. If you want to know more about this interesting world of super-high-priced keyboards, check out. Price: Lists for over $800.00 (yes NOT a typo). Check the latest price here or visit Maltron’s website for more information. The self-proclaimed “Truly Ergonomic Keyboard” is a new design, which does a good job of incorporating some ergonomic principles that have come down through the years. Its main distinction is the use of mechanical key switches, which put in a class with just one other ergonomic keyboard, the Kinesis Advantage. The TECK also features an innovative new layout, juggling the traditional QWERTY positions to increase efficiency and drastically reduce the width of the keyboard. As with the Kinesis Advantage, there is an adjustment period, and you may find yourself unable to type well on other keyboards once you get used to this one. Price: $249 direct from Truly Ergonomic. The Safetype is designed mainly to combat pronation. Like the Kinesis Freestyle, its main part is split into two modules. These modules are arranged vertically, and the resulting keyboard is addressed similarly to an accordion. (And no, I don’t talk to accordions. Or keyboards.) This vertical position keeps your wrists completely un-twisted, except when you need certain extra keys which are positioned horizontally between the halves. Since its tough to see what you’re doing while typing on a Safetype, the keyboard actually has built-in mirrors so you can watch your fingers. Safetype claims that their design has ergonomic benefits proven by a scientific study. Said study is posted in its entirety on their website, so if you have the academic brain type, you can sort it out for yourself. Price: Lists for about $300. Often found cheaper. Check the latest pricing. 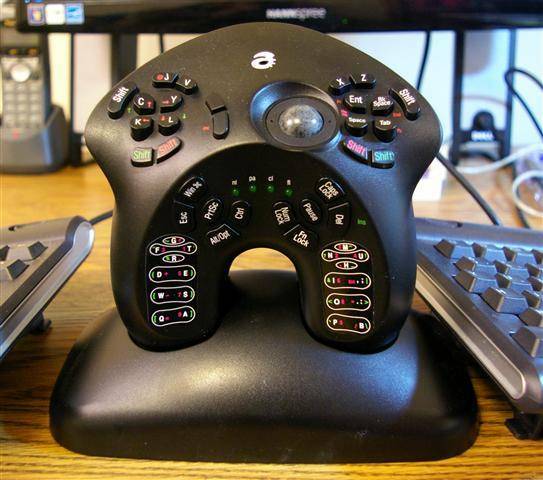 If you’re only interested in things that vaguely resemble keyboards, this is the end. But if you’re curious about radically different ways of making letters on a computer, read on. 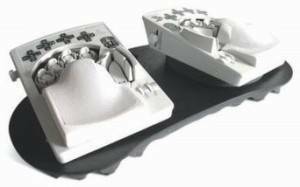 If you are more comfortable playing video games than typing, the AlphaGrip might be for you. Using a strange combination of rocker switches and buttons, it wraps a near-complete QWERTY keyboard around what looks like a standard video game controller. There’s even a built-in pointing device, though it’s of the tiny-trackball variety. The AlphaGrip is good for off-beat use cases such as typing in bed or while riding an exercise bike. Beyond that, I see nothing really all that “ergonomic” about the product in itself. I would only try it for standard typing if all else failed. Price: $109 directly from the manufacturer. One of the most unusual alternative typing designs ever to hit the market, Datahand flashed across the scene in the late 90’s and early 2000’s. I have long wondered what exactly happened to the company, so I tracked down their former president, Scott Scartozzi (now of Ergoguys) for comment. His reply was disappointing but frank: “I don’t know what happened.” According to Mr. Scartozzi, the company simply went silent, shortly after he exited. Their phone is dead, and though someone is still keeping the website hosted, its content has been frozen since 2005. What’s so special about Datahand to make it worth more than any computer keyboard – even a Maltron – and more than most computers? Zero wrist movement and lightning speed would be a good guess. While I’ve never had the pleasure of trying out a Datahand, its system is easy enough to surmise. The hands park on two well-formed rests, which are interchangeable for size customization. In this position, the fingertips rest on ten round keys, each of which is surrounded by four easy-touch “switches” or sideways buttons. 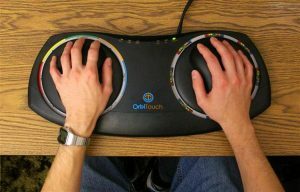 When the thumbs are included, this gives the Datahand at least 42 single-press keys – more than enough for the alphabet and common punctuation, and all without chording or the need to move your hand or wrist. You can learn more about Datahand at their aforementioned mummified website. Update June 2017: Website now is some kind of blog. This product will likely never be sold again. The In10Did is a new keyboard system developed by an inventor named Wayne Rasanen, who contacted me with a review sample sometime ago. As I wrote then, it’s like a chorded, more plausible version of the AlphaGrip. The keyboard’s small size and dodgy action make it somewhat less than an ergonomic dream, but the core idea is quite interesting for future applications. Price: Lists for about $125. Check the latest pricing. If you’re curious, read my complete write-up here. 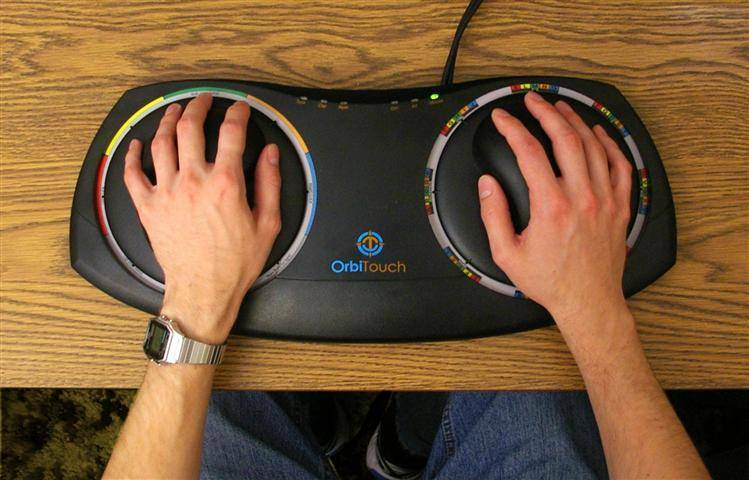 The orbiTouch “orbs,” where the user’s hands rest, look like they’re supposed to rotate, but they actually slide in different directions to make different letters. A simple chording system allows the user to combine left and right-hand slides for more options. As you might imagine, this mode of typing is comparatively slow even after much practice. One of the orbs also serves as a mouse equivalent, allowing you to “nudge” the pointer around the screen. Price: Lists for about $400. Get the latest pricing here. And there you have it – just about everything I know about ergonomic keyboards, summarized in a few short pages. I hope this helps someone make a pain-reducing decision and find their best ergonomic keyboard in the world.